Permalinks refers to the permanent links / URLs to articles / Pages and posts in your website. Think of the permalink as a way for anyone on the internet to link back to some content page on your Website. By default, WordPress permalinks will not be pretty so you may need to go into your settings and change the way links are displayed on your site. 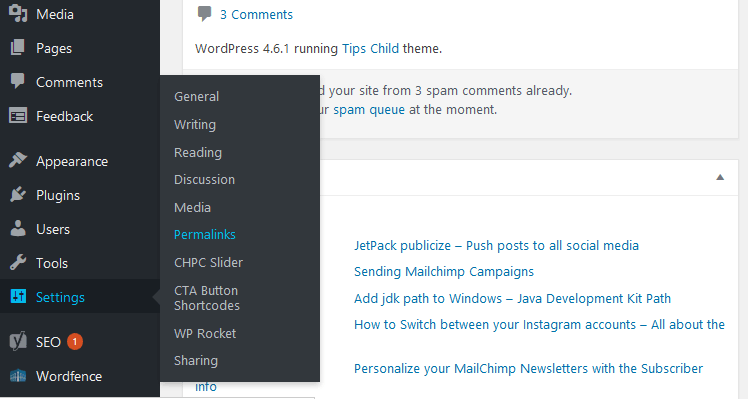 To access permalink setting on WordPress, go to settings then Permalinks. As shown in the image below. If you are using one of the recommended Web Hosts here , then you will easily edit your site’s permalink. The next step is to choose the link structure that you want to use. Some people prefer having dates before the post link. I prefer to have a clean link with just the link of the post . This is what I’ve selected in the image below. Plain : This has post id and is not good for SEO purposes. Post name : This one uses the post name only. A sanitized version of the title of the post (post slug field on Edit Post/Page panel). So “This Is A Great Post!” becomes this-is-a-great-post in the URI. A sanitized version of the category name (category slug field on New/Edit Category panel). Nested sub-categories appear as nested directories in the URI. A sanitized version of the author name. Note: Always end with either %post_id% or %postname% . Whereby post Id is the numerical ID of the post . And Postname is the actual name of the post. If you scroll down on the permalinks page you will see the Optional section for Category base and tag. I can however choose to change the Category base. Instead of leaving it blank. I can add a name in there eg cat . And the same is similar for Tags. After Making all the changes that you need to, Click on the Save Changes button . Feel free to watch the video above for the step by step guide. if your site was installed in a folder watch that video. More info about Permalinks can be found on the WordPress codex.